You are here: Home / Grange Notes / Hot new dance joins the Grange lineup on Sunday! Dance, Sing & Jump Around, plus Kids Trade & Play on Saturday make for a family-friendly weekend. Hot new dance joins the Grange lineup on Sunday! Dance, Sing & Jump Around, plus Kids Trade & Play on Saturday make for a family-friendly weekend. The snow has melted down a bit, but it was still easy to reach the top–without a stepladder–to mount the new sign for Dance, Sing & Jump Around above the one for Kids Trade & Play on Sunday afternoon. We’ve seen impressive growth in the number of families who come to donate out-grown, but still good kids’ clothing and pick up equally good larger-size clothing, toys and gear at the KT&P on 2nd Saturday mornings–from 9:30 to 11:30 as the sign says. On January 12th, there were about 100 people of all sizes, on a frigid day! The exchange features clothing for newborns through Junior 10 sizes, plus shoes, books, toys and maternity needs. Or you can just stop by for coffee or tea, and socialize while kids play, and get information about community resources for families. A small donation of $3.00 per family is asked to cover overhead, but no one will be turned away. Make it a family outing, and come visit! Then on Sunday afternoon, from 3:00PM to 4:30PM, DS&JA makes its Sunday debut at the Grange Hall. We welcome this series, which has been running for about 3 years in Plainfield, to use our larger venue, with much more parking. Dances for kids of all ages, including circle & line dances plus singing games will be taught by Liz Benjamin and Stan Carlson. Music this weekend will be by Katie Trautz & her students! FREE for kids, $5 donation per adult requested–no one will be turned away! If you don’t have a kid lying around the house, borrow one. Groundhog Day meeting ends on time! If like me, you enjoyed the movie with that name, you’ll know why I mention this fact…almost everyone arrived on time and we finished up in time for a great potluck dinner, with a birthday party joining us, no less! We have a new regular tenant, the VT Youth Theater, who have invested in helping us renovate the Grange Closet, to make room for their needs while still providing storage for Grange meeting paraphernalia. The VYT is a non-profit which provides high-quality theater training to kids from 5 to 18. To learn more, check their website: VT Youth Theater Contact Mary List-Wheeler, their director for more info. We will host another Cooking Workshop, date TBD, building on the success of “Delna’s Farmers’ Market Favorites” last year. 15 people had a great time, and cooked tasty Indian food at that one. At the next one, our talented teacher, Delna, will be teaching participants to make Chicken Biryani, in a “more advanced” class. Keep in touch for details! Building relationships with arts groups is one way we show how we serve the community by providing this venue. 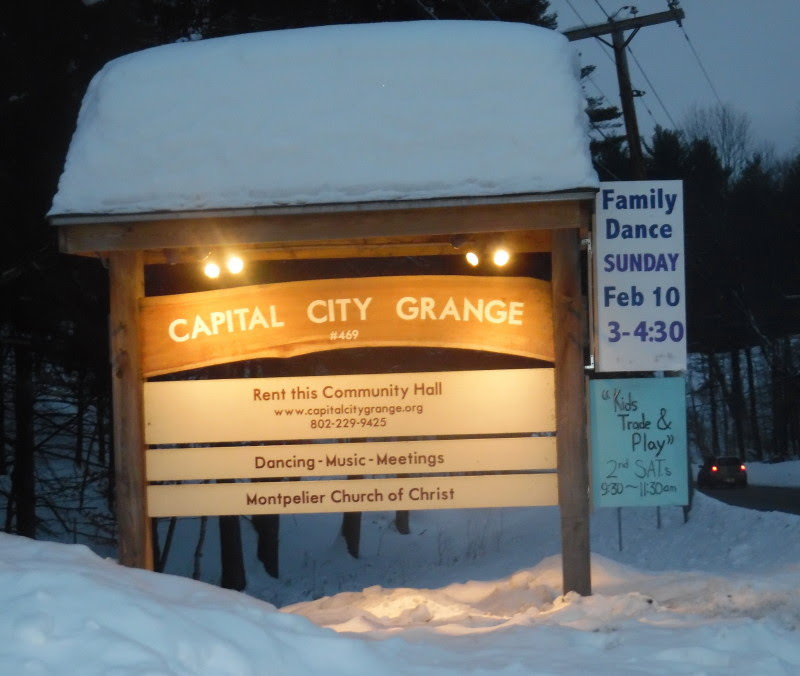 We think it will help the Friends of the Capital City Grange Hall in their next grant application to the VT Arts Council. Thanks to Merry Shernock for working with the VYT, as well as DS&JA! Acoustic panels are on their way! The FCCGH has ordered materials for at least 18 panels. Kurt Giavara and Tim Swartz will be putting the frames together in the next week or two, and the FCCGH will schedule a work party to fill them with acoustic batting, cover them with fabric, and hang them on the “old entrance” end of the Main Hall. We’ll be looking for feedback on the impact these make, for the many types of activities that call the Grange Hall home. We will be consulting with the various dance, singing and meeting groups to see how we can continue to improve the acoustics of the Hall. The “Repair Cafe” organizers from the Central VT Solid Waste Management District and the Onion River Exchange time-bank are very interested in holding another event at our Hall. Since we are so booked up, we couldn’t find an open date that worked for them in March, so they will hold one elsewhere, and will look for a future date to hold a Repair Cafe at the Grange Hall. Our arrangement with the Town of Berlin to be tax-exempt with regard to property taxes has been a continued boon to our finances, as was demonstrated as Treasurer Merry showed us the Grange financial records. She uses QuickBooks Online, and was able to project the data for Grange Meeting attendees to see. We have been able to invest in the Grange Hall, as we did last year–installing an on-demand water heater, pumping out the septic tank, re-grading the driveway and continuing our improvements around the ADA entrance. Instead of needing help from fund-raisers to pay our bills, we are able to keep on top of expenses even while putting money into improvements. We have hosted about 72 no-charge “rentals” of the Hall for Berlin families, individuals and organizations since getting the tax exemption in March, 2016, right about at the 2-per month figure we projected as our commitment. Our meeting was followed by the Monthly Community Potluck Dinner, once again full of treats, included the usual variety of tasty treats, from roast leg of lamb, to green salad, lima beans, crown roast, chicken with sauce, brownies, bread, pasta salad–and a birthday party! We were pleased to share food and fun with the guest of honor, Harvest, who is turning 12, and her friends and family. She asked to have her party at the Grange potluck, and then at the contra dance following! The dancers sang Happy Birthday with gusto, and ate up the birthday cakes at the break with equal enthusiasm. We never know exactly what will show up at our potluck dinners. Put the next one, on March 2nd, on your calendar!